Using data from the Generations and Gender Survey for 14 countries (Australia, Austria, Belgium, Bulgaria, Estonia, France, Georgia, Hungary, Italy, Lithuania, Norway, the Netherlands, Romania, and Russia) we study whether there is a divorce penalty for children in the probability of attaining a university degree. We find that, on average, the chances of receiving a university degree are about seven points lower for those whose parents divorced. This is a small but non-trivial effect. 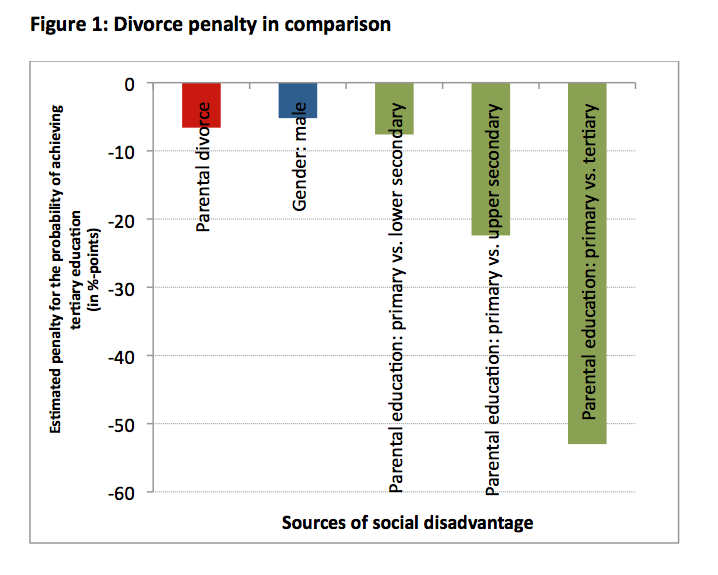 As shown in Figure 1 the divorce penalty is about the same size as the “college gender gap” (i.e., men are less likely to achieve a university degree than women) that has recently received a lot of academic and media attention (DiPrete and Buchman 2013). On the other hand, the impact of divorce on children’s educational attainment is much smaller than the impact of parental socioeconomic background. The chances of children of low educated parents receiving a university degree are 53 points lower than children of parents with tertiary education, and 22 points lower than those with parents with an upper secondary education. The divorce penalty, however, is not uniform and varies by socioeconomic background. We find that the penalty is more than twice as large for those who have more highly educated parents compared to those with more poorly educated parents. In the former case the penalty is 12 % points, in the latter 5% points. 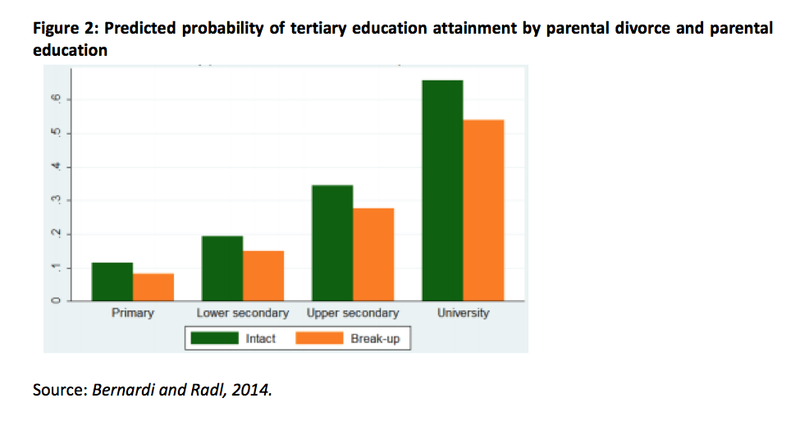 In Figure 2, it can be seen that parental divorce tends to be more detrimental for children of highly educated parents: the gap between children from divorced and intact families is larger for those whose parents have a university education than for those whose parents have only primary education. For children from low educated families, the chances of going to a university are rather low to start with, and a divorce does not seem to make a real difference. And if we look at Figure 2 from another perspective, we can also see that the degree of social background inequality is greater among intact families than among divorced families. We reach the same conclusions in a follow up paper on the consequences of divorce for educational attainment in the 1970 birth cohort in Britain (Bernardi, Boertien, Popova 2014). All in all these findings suggest that divorce has a (small) equalizing effect of social background inequality. Three important caveats are in order. First, although we have used the terms “consequences” and “impact”, proving that divorce has causal effect on children’s educational outcome is a complex endeavour. Unobserved family characteristics (for instance parental conflict) might drive both the occurrence of divorce and children’s educational attainment. Studies based on siblings differences and instrumental variables have also documented a divorce penalty, although the size of the effect is usually smaller than the effect based on naïve estimations as those discussed above. Second, we have only focused on achievement of a university degree and hence on the upper part of the performance distribution. Although we did conduct some robustness checks with alternative measures of educational achievement, the results might change if we studied a different outcome variable. In spite of concerns about over-qualification and unemployment of tertiary educated people in countries such as Italy, achieving a university degree is still a crucial asset for life-long earnings and employment. Third, we know that the educational gradient in the risk of divorce has changed or is changing in the majority of countries, so that nowadays low educated parents tend to be more at risk of divorce. To the extent that fewer highly educated parents divorce, the overall potential of divorce as a social origin equalizer is then limited. Previous research has pointed out four mechanisms possibly underlying the negative association between divorce and children’s educational outcome. These are: parental conflict (both pre and post divorce), change in parental time and parenting practices, parents and children’s emotional crisis linked to parental separation and a reduction in economic and social resources. Each of these factors call for different policy responses in order to support divorced parents in improving the future of their children. A deeper understanding of the scope of each of these mechanism is required to efficiently design policies capable of mitigating the adverse consequence of parental separation. In any case, although we do not know exactly how much, all four factors are likely play some role in the divorce process. Counseling would, thus, seem important to address parental conflict, while schools should play a crucial role in supporting children whose performance goes down due to difficulties linked to parental divorce. Parenting arrangements after divorce and conciliation policies are important to maximize the quality time that parents spend together with their children and minimize the time squeeze of single parents. Finally measures of income and employment support might reduce the risk of child poverty associated to divorce. Bernardi, F. and Radl, J. (2014), The Long-Term Consequences of Parental Divorce for Children’s Educational Attainment, Demographic Research, volume 30, article 61: 1653-1680. DiPrete, T. and Buchman,C. (2013), The Rise of Women. The Growing Gender Gap in Education and What It Means for American Schools. New York: Russel Sage Foundation.